So far, Pope John Paul II is the only successor of Peter who made a pilgrimage to the country of maple leaf. The first visit of his Holiness took place in the year 1987, the second one in 2002 in Toronto during the celebrations of the World Youth Days. 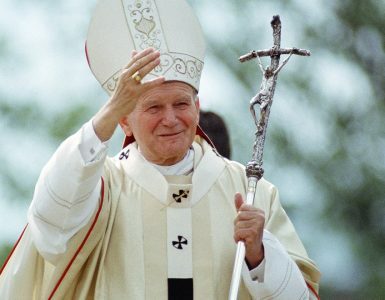 This year, on April 2nd, already for the fifth time in Canada was celebrated the DAY OF JOHN PAUL II. Initially established in the province of Ontario, now is celebrated throughout Canada. In the Polish church dedicated to Our Lady of Częstochowa in Saskatoon, Saskatchewan also celebrations took place, starting with a holy Mass celebrated on Sunday March 31, 2019, by the Pastor of the church, Fr. Andrzej Wychudzki. 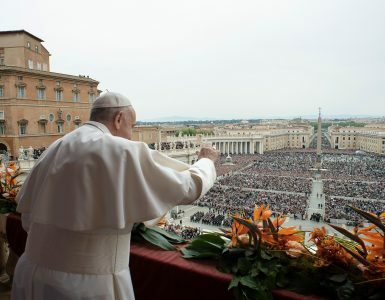 The following celebration, a votive Mass was celebrated on April 2nd, on the 14thanniversary of the Pope John Paul II departure to the House of the Father. The Mass was celebrated to implore Heavenly Father to stop those who are trying to put our Holy Patron in a bad light. After the Mass, we prayed with the Litany to St. John Paul II, and then, parishioners along with members of the John Paul II Chapter were invited to a parish hall to see the film “Liberating a continent: JOHN PAUL II and the fall of communism”. The president of the Saskatchewan Chapter of the John Paul II Foundation, Bożena Kilanowski, at first welcomed all participants and then, gave thanks to Fr. Andrzej Wychudzki for the Eucharist and touching homily and Marek Wiatr for the beautiful music. We are also expressing our gratitude to the Polish Catholic Association in Saskatoon for sponsoring the flower decorations in the Church and in front of the John Paul II monument. On three tables, books and press related to the Pope were presented. Some of the books like: “Why He Is a Saint” or “Witnesses of holiness” has been rented to people who wanted to deepen their knowledge about the Pope. Bożena Kilanowski was reading her own poem entitled “The Communion of Saints” from the book “Written by heart – Poetic diptych for Saint John Paul II.” This book is a collection of poems prepared for the 35thanniversary of the John Paul II Foundation establishment. The book includes poems written by forty-nine authors from Poland and written by Polonia. We should mention that the book was published in2016 in Rome by the John Paul II Foundation – The Center for Documentation and Research Center of the Pontificate of John Paul II. 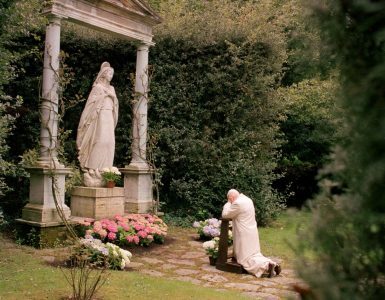 The move which we have seen, presented many important facts, proving the great role of the Polish Pope in the fight against communism.